We have operated our home 'Estrella Mountain Escape' for almost 20 years and it is one of the few premier custom vacation Homes located in the 'Enclaves' in Estrella Mountain Ranch! This is a private 'mini estate' custom home. Many happy and satisfied guests from all over the US, Canada and Europe have enjoyed our home and some have returned more than once! Please see our guest comments. We have currently added many upgrades and special amenities for your enjoyment! Just added an outdoor covered patio firepit for those cool evenings! See list of amenities below for details. We welcome you to join us for unforgettable views, natural surroundings, ultimate privacy and the best accommodations for your visit. This Beautiful Custom Built Home backs to Estrella Mountain reserve and affords guests ultimate privacy. Enjoy sunsets and mountain vistas and star gazing while soaking in your private custom designed pool and spa. The property is professionally maintained with many varieties of desert plants and trees including large Saguaro cactus. Relax and have dinner on the oversized covered tiled patio comfort controlled w/3 ceiling fans or enjoy quiet conversation while lounging on teak steamer chairs and two custom upolstered bench seats. There is gas firepit that is under the covered patio with beautiful mountain views and partial views of the pool area. Relax under the stars on a cool evening with your covered gas patio firepit! There is nearly 2800 square feet on two levels. The home includes three bedrooms and three baths. One master bedroom suite, with King pillow top mattress and Roman soaking tub (over-sized tub) with separate shower area and double sinks. This room opens up onto veranda with views of lake and mountains, the second bedroom has a queen bed and also opens up onto the veranda and the third bedroom has two twin beds which can be converted to a king upon your request. There are views from all bedrooms through large arc style windows. This vacation home sleeps six privately add another two on the quality sleeper sofa! The family room has a gas fireplace surrounded by custom tile and cushy leather sofa and love seat. There is a new Lazyboy lounge rocking chair where you can cozy up the the fireplace and read a book. View Samsung 46' LED HDTV Smart TV connect to internet and BLURAY DISC Player with sport channels added! The Living room has a sofabed, loveseat and ottoman, there is a private wet bar for entertaining and a separate dining room w/seating for six, a large custom designed kitchen with counter seating for four are some features of this home. The two car garage has an electric door openers. Central air and heat as well as ceiling fans are throughout. The living room features 'quiet' area along with new Lazyboy queen sofabed and matching loveseat. There are several books and cd's to enjoy. The home is gorgeous and very comfortable. You may spend some quiet time lounging on custom upolstered window seat while curling up with your favorite book. This home affords Views! Views! and more Views! There are numerous areas in and around the home that afford guests private areas even when traveling with a group. We offer free access to the internet, surf the web, check email, upload photos, keep in touch with friends, family or the office from anywhere in the house, out on the patio or balcony, or even by the pool. It's easy to use and available to you as our guest. Walk to lake and golf course just around the corner. 10 minutes to Goodyear Ballpark~15 mintues to NASCAR~Close to all sports. 5 min to Safeway shopping center with Taco Bell, McDonalds, Starbucks, Papa Johns Pizza, Oasis Bagel Shop and Walgreen's. There are many other stores less than 2 miles from the house! Check our availability calendar to make your travel plans! Hello, my name is Lynn. I am the former owner of a very successful Commercial Real Estate Company in New Jersey which I recently sold. I have over 25 years of Commercial Real Estate experience and over 200 million dollars in personal sales. My expertise was in listing, contract negotiations, marketing and property development. I was all about business, however, I wanted to do something more creative and fun. Back in 1998 while traveling from Kauai I had a conversation with a woman who was in the high end home vacation rental business. She had homes all over the world and this intrigued me. 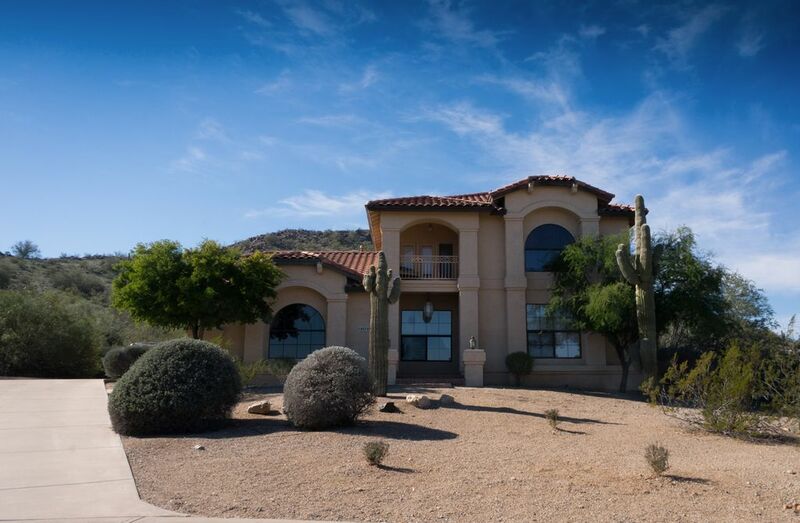 I started to research information and bought my first property in Goodyear, Az., Estrella Mountain Ranch; it is a custom home with a pool and spa with great views and privacy! I went on and purchased Poipu Villa Vista in Kauai, Hawaii with ocean, golf course, mountain and crater views and an international vacation home in San Miguel de Allende, Mexico, with a rooftop deck and views of the entire city. Our latest purchase was in Lake Como, New Jersey it is a seaside community just a half block from the lake and eight blocks from the ocean. Owning vacation properties gives me a chance to be creative in renovating and decorating these custom homes to correspond with thier locations. Our goal is to have the stay for our guests become a special and unique experience and create memories for them that they will cherish forever. We live in a stressful world and each property has a calming effect that our guests love. They let us know we have achieved this by their comments! Estrella Mountain Ranch is a very unique community located in a gorgeous setting in the Estrella Mountains with two lakes, golf course, star gazing monument and much more. The house is custom and in a very private setting. You are surrounded by desert scenery including saguro cactus and moutains and lake views. Yet the house is near downtown Phoenix, Scottsdale, Sedona and even just a 2.5 hour drive to Sedona and Palm Springs! The sunsets and views from our home are AMAZING! The evening star gazing is incredible! Our guests enjoy a large covered patio that backs up to the pool and spa with seamless indoor outdoor activity. You may see a bobcat, quail, a cottontail and other desert wildlife. Our spa and pool are surrounded by estrella mountain reserve for ultimate privacy! PLease don't be fooled by so called vacation homes that are tract homes with no privacy or views at all! Just added a new outdoor gas firepit for those cooler evenings! large washer with dryer in private laundry room off kitchen. large living room with huge arch window in front of house. relax and enjoy while others are in the family room playing video games! newer built in whirlpool large capacity! Jenn air electric cooktop and Whirlpool oven/microwave combination! Newer! cappuccino/expresso Breville coffee combination. Reverse osmosis water system also connected to ice maker for pure fresh water! JUST added New Sharp mini component system. 5 CD changer with IPOD and IPHONE docking and charging plus USB and plays windows media and MP3. This is located in the living room. View the night stars in complete darkness or get sunbath lounging around the private fenced in pool area has lighting for evening use! Estrella Mountain ranch, very private property. views of mountains, lake and stars. Golf: There is a full service restaurant within the community. You can order pizza and rent videos at the local center too. Safeway Super Market, Starbucks, Chase Bank and other stores just 2 min. from property. Smoking not permitted in home. Special requests may be accommodated, if advance notice provided. Enjoy Arizona at one of the finest rental homes! Check availability calendar to make your travel plans now.